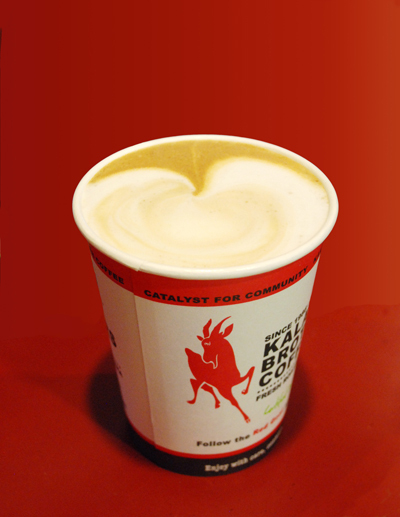 Lulu’s is proud to serve coffee from a favorite Alaskan roaster, Kaladi Brother’s Coffee. Kaladi coffee is fresh roasted in Anchorage and shipped to Lulu’s weekly. Trieste Blend, a medium-dark roast, is used for drip and espresso coffee drinks. The drip coffee is made strong and fresh every hour, with free refills for in-house customers. The full spectrum of espresso drinks are proudly made by Lulu’s baristas. Kaladi Trieste Blend can also be purchased by the pound, whole bean or ground. Lulu’s also offers Sipping Streams teas, chai tea lattes, Ghirardelli hot chocolate, blended coffee drinks and real fruit smoothies (no mixes or sugar added).